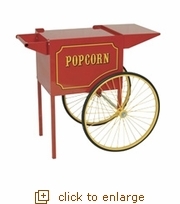 Popcorn Popper Cart - 4oz. Home · Bowls & Party Supplies · Commercial Popcorn Poppers · Popcorn Popper Cart - 4oz. Product Reviews for Popcorn Popper Cart - 4oz. An old fashioned street cart to be used with our 4oz. commercial poppers.